This new edition of a core undergraduate textbook for construction managers reflects current best practice, topical industry preoccupations and latest developments in courses and fundamental subjects for students. While the construction process still requires traditional skills, changes over recent decades today demand improved understanding of modern business, production and contractual practices. The authors have responded accordingly and the book has undergone a thorough re-write, eliminating some of the older material and adding new processes now considered essential to achieving lean construction. Particular emphasis is given, for example, to supply chains and networks, value and risk management, BIM, ICT, project arrangements, corporate social responsibility, training, health and welfare and environmental sustainability. Drivers for efficiency: lean construction underpinning production management and off-site production methods. Sustainability: reflecting the transition to a low carbon economy. Corporate Social Responsibility: embracing health & safety, modernistic contracts, effective procurement, and employment issues. Building Information Management: directed towards the improvement of construction management systems. 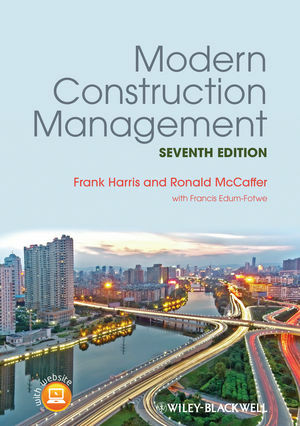 Structured to reflect site, business and corporate responsibilities of managers in construction, the book continues to provide strong coverage of the salient elements required for developing and equipping the modern construction manager with the competencies and skills for both technical and business related areas. Frank Harris, BEng, MSc, PhD, DSc, CEng, MICE, FCIOB is Emeritus Professor of Construction Science at the University of Wolverhampton. Ronald McCaffer, BSc, PhD, DSc, FREng, FRSE, FICE, FCIOB, is Emeritus Professor of Construction Management at Loughborough University. Francis Edum-Fotwe, BSc, MSc, PhD, MASCE is Lecturer in Construction and Project Management at Loughborough University.